When doing work on a site or around the house, sometimes you need to saw through materials like wood, drywall, or metal in order to get the job done. While you can use a standard hand saw to do these jobs, doing so is arduous and can really put a lot of strain on your bones and muscles. A great tool to help you get through these types of jobs is the reciprocating saw or recipro, which is also erroneously known as the all-encompassing sawzall. 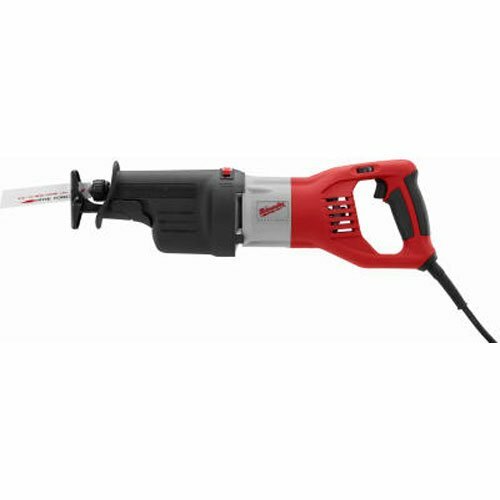 These types of saws come in corded and cordless varieties and both make doing precise cuts a much easier prospect. With so many products out there from major brands like DeWalt, Milwaukee, and Bosch on the market today, it can get a bit confusing when it comes to finding a device that’ll do the job properly. To make your search easier, we’ve collected several excellent models of reciprocating saw that’ll help you get the job done. Three are premium models, backed by some of the brand names that we’ve just mentioned, and the final model is a budgetary device that has a good set of features, but won’t set you back hundreds of dollars. Our Gold Pick tool comes to us from DeWalt, a company that has been in operation since 1924. 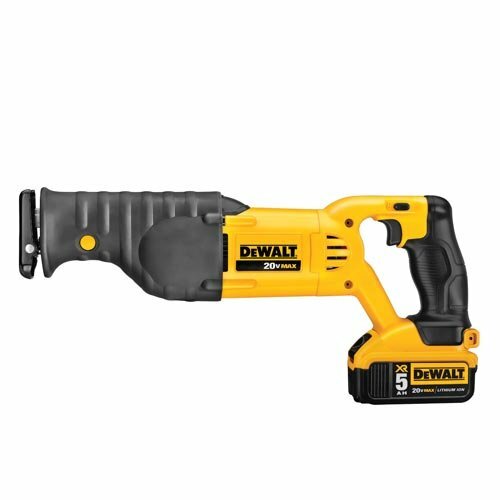 DeWalt is one of the most famous names in power tool manufacture and has become well-known for developing sturdy devices that can withstand the rigors of the worksite. This device, which was developed as part of the 20v Max Series from DeWalt, has some great features that any professional or private user will find very useful. Firstly, rather than utilize a single position system for blade placement, this device uses a four position blade holder that will help you execute various jobs with relative ease. Need a more stable base, so that your cut is flush and straight? Then, you can simply utilize the relatively flat surface on the top of the device and face the blade upwards before you start your cut. Need to cut the glue that keeps tiles secured to your floor? Then, simply place a short, flexible blade sideways under the tile and cut away. This is just one of the variable systems that this device employs, and it’s with this type of versatility that you’ll really start to appreciate this power tool’s functionality. Remember, when changing the blade’s orientation or when swapping a blade out, you should either remove the battery for the device, or engage the trigger lock. The trigger lock is located right above the device’s trigger and will keep the unit from accidentally engaging during this process. The second variable function on this reciprocating saw is the variable speed settings. With this saw, you’ll be able to vary the speed from very slow cutting to a speed of 3,000 strokes per minute. This degree of variability will let you alter the strokes per minute to accommodate different materials. This can help you manage your blade’s durability, since it’s easier on the blade to saw through denser materials at a faster rate. The final piece of built in variability comes in the tool’s adjustable shoe. This will help you better measure the depth of the cut. If you need a shallower cut, simply extend the shoe to shorten the length of the cutting area. You’ll find that this level of adjustment will make cutting objects much easier to gauge and will help you avoid cutting into areas that you don’t wish to damage. Since this is a cordless style of power tool, you’ll have to utilize one of DeWalt’s slide-on battery packs. These packs are lithium ion-based and the included battery is a 20v max device that will actually perform at around 18v under a working load. Without the pack, the device is about 11.9 pounds and with the pack slid on, the entire assembly weighs about 13.29 pounds in totality. This power system lasts quite a long time; with some users attesting that they get about 300 to 400 two by four cuts on a single battery. When you do start to run out of juice, this kit comes with a slide on charger that features an LED that will blink red while charging and glow a solid red when it’s done. If you need it, you can purchase chargers with USB or cigarette lighter connectors for even more versatility. As we’ve mentioned previously, Sawzall is a broadened term for reciprocating saws. While this is what the category has come to be known as, the term actually originated with the world’s first reciprocating saw; Milwaukee’s own Sawzall. The Milwaukee brand itself has seen much innovation in its 92 year history. As the originators of this type of reciprocating saw and the current trademark owner, you can easily see that Milwaukee produces a great, reliable product. 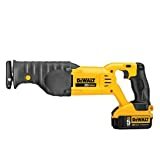 This version of the Sawzall is powerful. Amperage on a reciprocating saw typically ranges from 11v to 15, with 15 being an exceptionally powerful tool. This Sawzall is on the maximum end of the spectrum at a full 15 volts of power backing its one and ¼ inch blade. Usually, when a device has this much on-board amperage, there is typically a lot of vibration, but Milwaukee’s engineers were able to cut down on the vibration on this model by using a counterbalancing system that also makes the whole device very easy to use. The result is a smooth operating device that won’t cause unneeded fatigue while you operate it for extended periods. Even though it’s counterbalanced, at 13 pounds you might notice that this device is a little bit heavier than some of the corded models on the market today. Usually corded models are a bit lighter than those that have to incorporate a cordless battery into their construction, but this additional weight is actually an artifact of the counterbalancing that makes this device so vibration-free and easy to hold. Milwaukee actually added a little weight in sections to create these enhancements. When it comes to speed variability, this device, at its maximum speed, is a little slower than our Gold Pick. At 2800 strokes per minute, this is still a very fast cutting device; as a matter of fact, the device even incorporates overload protection, which effectively counters any motor burnout that can occur as a result of the blade moving at such a high rate for extended periods of time. The front assembly of this Sawzall also uses some great systems that make the process of cutting much more streamlined. Firstly, as a protection against hard impact blade lockups, this device uses a gear clutch system that isolates the drive train, so that the motor won’t take damage from these unfortunate situations. Secondly, the device also uses an adjustable shoe that will help you measure out the area that you need to cut more accurately. The final front assembly system that makes the process easier is the inclusion of a Quick-Lock system that will enable you to change the blades out without the need of an external tool. Developed by the second oldest tool manufacturer on our list, our Bronze Pick has a vast history of quality craftsmanship to fall back on. Makita tools started out in 1915 in Anjou, Japan and has always had powered devices as a primary company focus. In 1969, they introduced the first rechargeable power tool and have since gone on to operate in nine countries worldwide. Makita’s slogan is, “best-in-class engineering”, and in this device you can see that they are dedicated to this way of thinking in their power tools. Firstly, Makita included what they call “star protection” in this device’s construction. Star protection allows the device’s battery and the saw itself to communicate. When overheating, overloading, or over-discharging occurs, the saw will electronically note the problem and send a signal to the battery, which will then automatically shut off. This protection will not only protect the tool, but you as well. When it comes to the stroke output of this device, this reciprocating saw performs admirably. At its maximum speed setting the device can achieve 2900 strokes per minute. 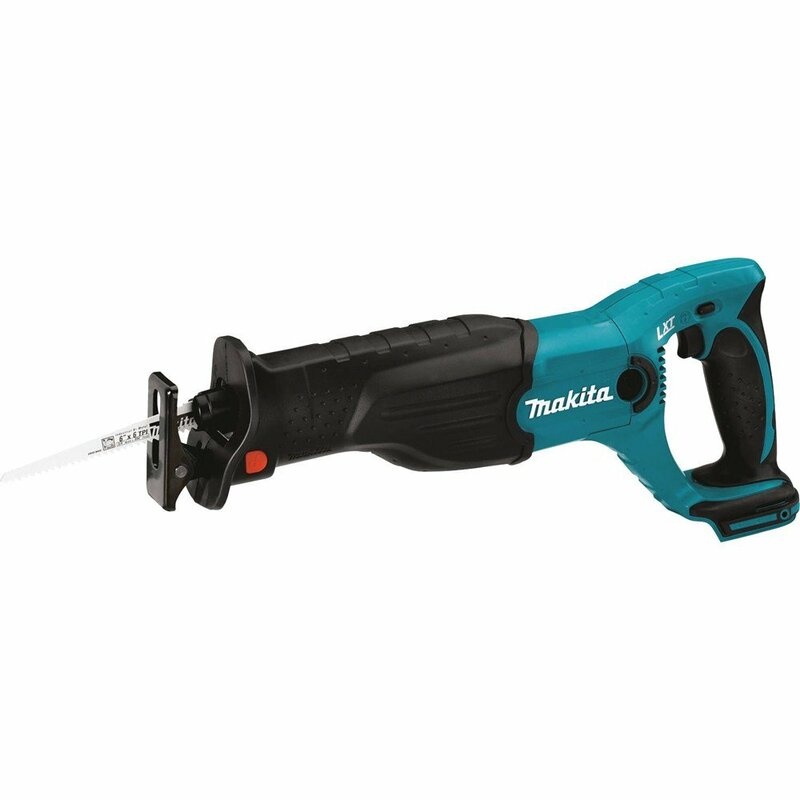 To change the speed of the strokes, this Makita reciprocal saw also has a fairly intuitive system; just vary the pressure on the very responsive trigger to vary the speed of the device’s strokes. The actual stroke length is about 1-1/8-inches or so, and there is an adjustable shoe to grant more stability and vary the amount being cut at any time. A great feature of this reciprocal saw is the fact that it incorporates a tool-less design when it comes to a few functions that are available on the device. Firstly, to change the blade, simply twist the section of the blade assembly and the blade will eject from the housing. Similarly, to adjust the shoe, just press the button at the base of the front assembly and the shoe will unlock, allowing you to set it to the length that is most useful to you. This device is also one of the lightest on our list. Even with the lithium ion battery attached to the device’s chassis, it’s only about eight pounds. This incredibly light design will make the device very easy to operate for hours on end. This is very atypical, since cordless recipros tend to weigh a little more than the cordless varieties; mostly due to the battery. When it comes to the battery, this is an amazing device as it charges from empty to full in a little more than 30 minutes. This is perfect if you want to take a break and return to your work in this period of time. Many of the recipros on the market are going to set you back at least $100, but there are some great options that come in well under this price point. A great example of a reciprocating saw that you can find at or around the $50 price point is the Porter Cable PC75TRS. It’s a strong little device that has good power and is perfect if you need to buy a few cheap devices for the worksite or are just ballin’ on a budget. Our budget pick comes from the oldest power tool manufacturer on our list. Porter-Cable has been in operation since 1906, and they have spent much of this history manufacturing affordable devices that won’t break the bank. This recipro has some great features for its price range; a trait that many of the company’s products seem to exhibit. Firstly, it’s very easy to replace the blade on this device. Simply twist up the top side of the blade housing, and then pull the blade out. The device is corded, so the company was able to shed a lot of excess weight by not including a battery. The result is a very lightweight power tool that’s about eight pounds; you simply won’t experience much in the way of muscle fatigue with this beauty. For greater control, there is a three position adjustable shoe at the end of the device. Simply press the button positioned along the bottom, and you can slide the shoe up so that you can cut at the depth you want. As variable speed is a great feature for a recipro, this unit utilizes a trigger-based system to manage the strokes per minute. Depress lightly for fewer strokes each minute, and use greater pressure for faster ones. This thing has an unbelievable top speed of 3200 strokes per minute. You’ll find that there are two main options when it comes to reciprocating saws: cordless or corded models. Both of these are great on professional or amateur jobs, and which you pick will greatly vary based on the job’s requirements, but here is a rundown on each type and the strengths and weaknesses of both. Corded – With corded models, you’ll find that you will have more on-demand power since you can draw directly from an outlet. Also, these models are much lighter than the cordless variety since they don’t have to utilize an on-board battery to draw power. 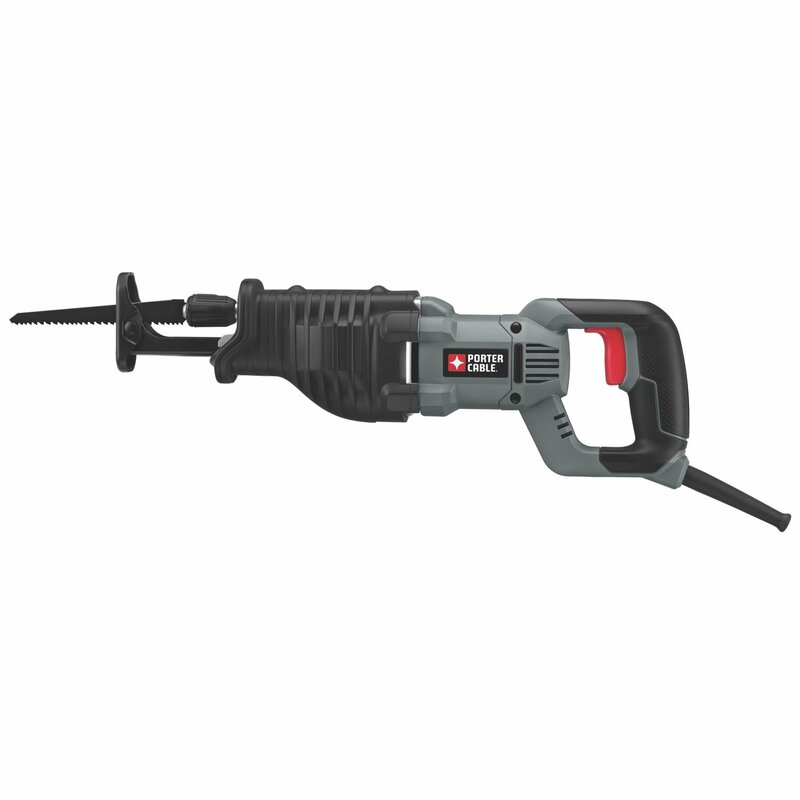 There are typically variations on cord length and flexibility, so experiences may vary with corded power saws. Typically, you’ll have less maneuverability since you’ll always be tethered to an outlet and sometimes the cord can get in the way of your cutting action. Also, since you are connected to a cable, there is always the threat of cutting it by accident during day-to-day operation. Cordless – This is the best choice on worksites where there is no power source. Because of its cordless design, this style of saw is more maneuverable and easier to use. As a result of the cordless operation, you’ll also find that cordless reciprocating saws have greater cut action than those that utilize a cord. Since there is a battery, these can get quite heavy, which will lead to muscle fatigue after numerous cuts. Also, you’ll need to charge these constantly, and when you have extensive cutting to do, you’ll also have to bring additional batteries to keep up workflow. Finally, as the battery depletes, so does your power. As a rule, the longer the stroke length the faster you’ll be able to execute a cut. Different reciprocating saws will have varying stroke lengths. While a long length (say, around ¾ of an inch or so) might be advantageous to the job you are doing, you also don’t want to have a saw that protrudes too much past the boundaries of the material that you are cutting as this can pose a problem to any adjacent structures. Fortunately, some saws are adjustable, but knowing the scope of the jobs you’ll be doing is really the best way to get a handle on what stroke length will be best for you. Typically, stroke length varies from about ¼ of an inch thick to about ¾. The power level of your reciprocating saw typically varies by amperage. The more amperage you have in your power tool, the more power it’ll have to execute jobs. As mentioned previously, cordless models tend to lose amperage the lower the battery gets, so that should always be a consideration when selecting a cordless model for a job that’s going to need a lot of raw cutting power. Currently, the effective range of most power saws on the market is about nine to 15 amps of power. For the most part, if you are planning to stick to DIY-style jobs, you really won’t need more than 11 amps. For larger projects you can scale to 13 amps. 15 amp models, on the other hand, are well-rated for very large, professional-grade projects that need a lot of cutting power. Lighted Plug – This is a simple feature that will prove invaluable with corded models of reciprocating saw. This system employs an LED that will let you know when the device is actually powered on and ready. While this might seem simple, it’s the perfect enhancement for dimly lit jobsites where you find that you’re constantly working with a cord that is constantly at its max length. Rubber Cord – Rubber cords provide extra flexibility to your work and will ensure that you have added maneuverability when performing your cuts. Replaceable Blades – As a rule, extended use will eventually wear your saw blades down. This is especially true on professional work sites. Some reciprocal saws will allow you to easily replace the blades with little-to-no additional tools. This will help ensure that you are always working with a keen blade; thusly, ensuring that your work is always unhindered. Orbital Action – This feature completely changes the action of the reciprocal saw blade. Rather than moving up and down, this feature has the blade moving in an oval or elliptical pattern. As a general rule, these types of reciprocators cut much quicker than the traditional type. Adjustable Shoe – This is one of the best stability enhancements that you can find on some models of reciprocating saw. Simply put, this feature gives you more adjustment on the depth of the cut that you can make with your reciprocating saw. This added stability will ensure that you always make a uniform incision on the material that you are cutting. Whether you are a professional contractor or a part-time DIYer, incorporating a reciprocating saw into your work repertoire will help you finish the majority of jobs in a much quicker manner. This list provides a few really great devices that can help any user who wants to cut a plethora of materials quickly and efficiently. While this list only has four entries, there are actually many great models of recipro on the market. If these don’t work for you, use our pre-purchase considerations to find a product that’ll fit your needs more closely.